How to Report Blog Duplicated Content to Google DMCA - This time we will discuss is how to report duplicated article (copy paste) to Google DMCA. 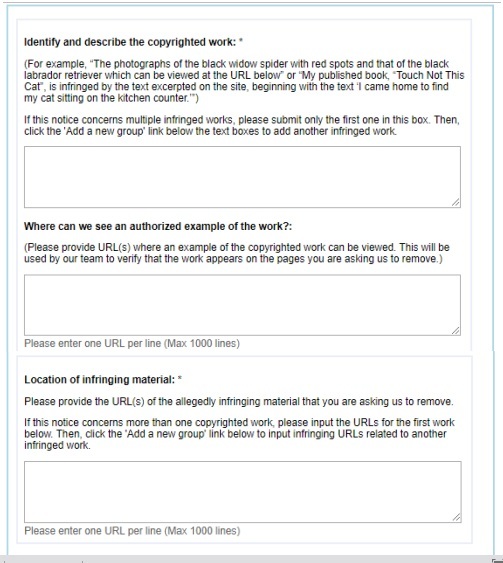 So for those who do not know or still lay, this Google DMCA is one of the free tools provided by Google to crack down on the perpetrators of our blog article copied. So for friends who often experience the article duplicate by others, can use this DMCA removal tool from Google. Guaranteed duplicated content articles reported immediately disappear from the circulation of Google. My experience using this tool started exactly a few days ago. As usual, I checked the backlinks that led to the blog en.marahmerah.com. There are some blogs that include the URL of this blog but once I check his blog was full article round Duplicated round (unedited intent). And most surprisingly, not only the article Duplicated. Images and even AdSense ads also come to Duplicated: 'v. Although the ads do not appear anyway. But clearly, there is a space/gap between paragraphs that I believe is similar ad space ads belonging to this blog. It instantly makes me curious and wants to try to report to the Google DMCA. This is because it is the first time report blog duplicated in Google DMCA. So yes a little hesitate too, is it true that the article reported will soon be removed by Google? Then how to report it? Okay, then the old-time directly refer to the tutorial to submit articles Duplicated to Google DMCA follows. 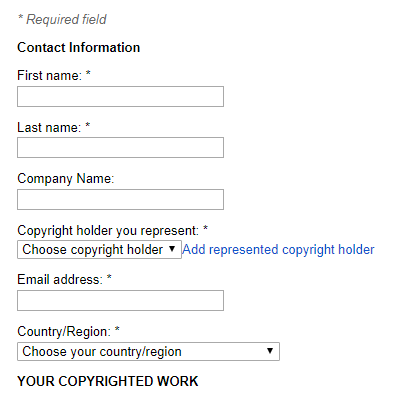 Here I will provide a step-by-step example to report to Google DMCA. The way is easy and of course free. So my friends do not need to confuse the cost issue. The first step please go to the Google DMCA Notice page. In it, there is a form that needs to be filled to report plagiarism content. Please fill in with valid data to avoid rejection when reporting. If you are confused, can be adjusted with me below. So to make it easy, here I divide into 4 parts, namely Contact Information, Copyrighted Work, Sworn Statements and Signature. In this section, there are several fields filled with first name, last name, company name, copyright holder, email address and state/territory. Please fill in with actual information data as a form of responsibility regarding the reports submitted to Google DMCA. Column 1 serves as a content description container in plagiarism/copies. So just fill in the example of paragraphs/sentences are plagiarism / Copas. If the copies a full article still enter 1 paragraph only. The next section is Sworn Statements. Here your task only needs to check the three statements that have been provided. There are 2 points you need to fill in this section. The first is the date with the format MM / DD / YYYY which means, month/ day/year. Next the second is your full name. So do not be mistaken. The last step is to click the Submit button to finish the reporting process to Google DMCA. Make sure you have checked one by one the form before Submit. It aims to avoid form filling error. If already submitted, just wait for the removal process to run. Well if you want to know whether the copies actors link has been successfully deleted or can not through the following link. There will be whether the report you have sent has been approved or not. as additional, the report you send in DMCA Notice is not necessarily always granted. There are times when Google DMCA rejects your report. Usually, Google DMCA will send an email containing the lack of information/data that you enter on the form. Okay, I ended up here. This is how to easily report Duplicated articles to Google DMCA. Good luck and hopefully useful.